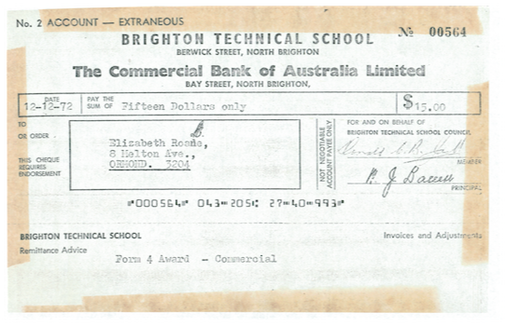 Documents - Brighton technical school, Victoria, Australia. Some of these documents have multiple pages. Click on the cover. Wait for it to load. ​The SlideShow 'Play' and 'Arrow' buttons should load at the top of the document cover. This is to certify that Norma Thompson has completed satisfactorily the Course of Study prescribed for this Certificate. Dated at Brighton Technical (Girls) School this 25th day of Nov A.D. 1927. Head-teacher's name W. Nash. Rob Stevenson Inspector of Schools. Department of Education, Victoria. Junior Technical Certificate. This is to certify that Pamela Joy Howard has completed satisfactorily the course of study prescribed and on examination has obtained a Pass. 1959. Number 85841. Director of Education. Alan H Ramsay. Education Department of Victoria. Intermediate Technical Certificate. Diploma Entrance Standard. Pamela Joy Howard. First day of December 1960. Brighton Technical School. Certificate of Excellence. Awarded to Pam Howard. Studies. St. John Ambulance Association. This is to certify that Pamela Howard has attended the Course of Instruction in Home Nursing for Junior Classes at Brighton Girls Technical? has passed the Examination. 30 September 1960. Spicers cardboard box used for holding Brighton Technical School Exercise Books. Photo courtesy of Wendy and Peter Dyete. Education Department, Victoria. 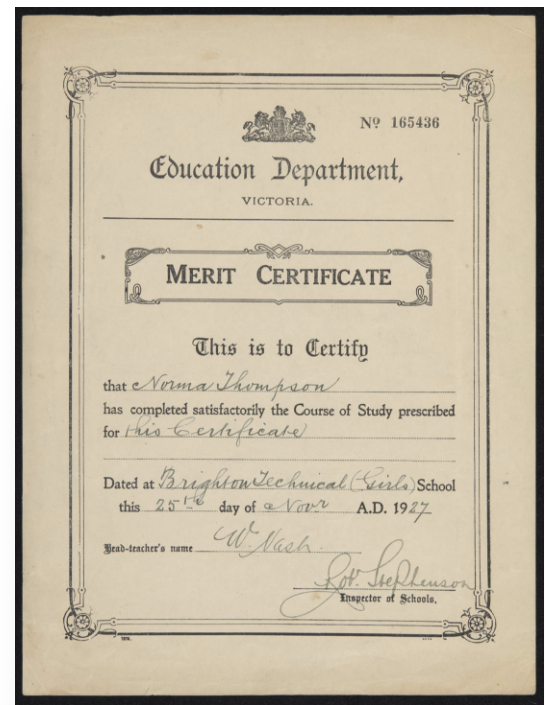 Merit Certificate. This is to certify that Shirley Mae Parsons (married name Joy) has completed satisfactorily the Course of Study prescribed for this certificate. 11 December 1946. Victorian Baby Health Centres Association Certificate. This is to Certify that Shirley Parsons (married name Shirley Joy) of Brighton 'Girls' Technical School has attended a Course of Lectures in Infant Hygiene and in Examination gained 100 marks. 5 December 1947. Department of Education, Victoria. Junior Technical Certificate. This is to certify that Shirley Mae Parsons (married name Shirley Mae Joy) has completed satisfactorily the course of study prescribed and on examination has obtained a pass at the Higher standard. December 1947. Number 37469. Director. From left to right, Barbara Gould, Hilda Smith, unknown, unknown. "Barbara and Marina Gould, aged 13 and 15, of St Kilda Street, Middle Brighton, have collected 1,354 eggs since Show Day. Their school mates at Brighton Technical School have collected more than 3,000 eggs". Addendum: In 1951 Barbara Gould collected the most eggs. In recognition of her achievement she was asked to unveil a special hospital bed at the Women's Hospital. Unfortunately as Barbara contracted polio she was unable to unveil the hospital bed. Jubilee Revue - 50 years - The Great Musical My Fair Lady and Comedy Acts. School Hall, Cochrane St.
A Concert by the Students of Brighton Technical School. 1970. Mr. P. Bell, Robert Townsend, Ian Havin, Alistair Lindsay, Paul Elliott, Paul Spano, Noel Watson, Stuart Hughes, Mrs. J O'Neill and Michael Hurd. Official Opening of the Walter Jack Assembly Hall and Presentation of Awards. Prospectus. Brighton Technical School Girls Junior Technical Day School 1944. Brighton Technical School 1951. "Commonwealth Jubilee Year" Brochure. 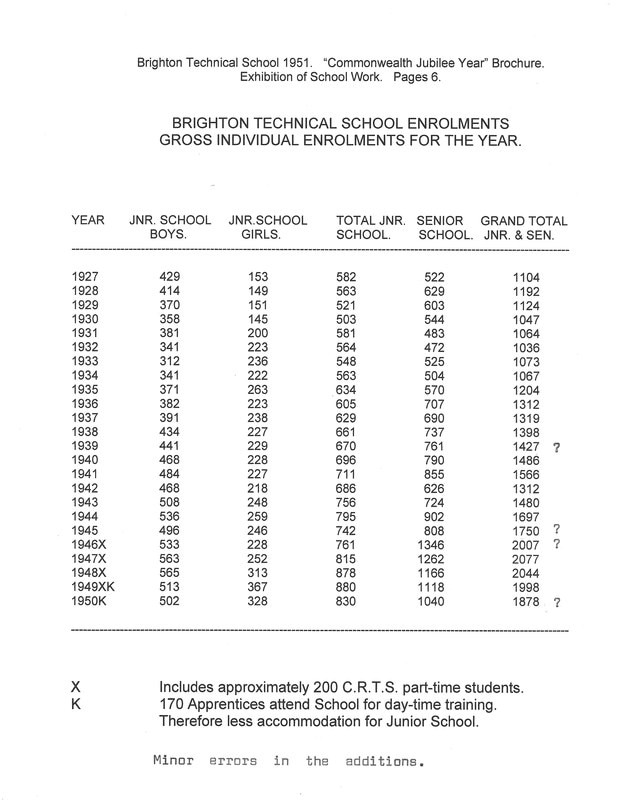 Brighton Technical School Enrolments for the Year. Education Department, Victoria. Technical Schools. Entrance and Grading Examination for Junior Technical and High Schools. 30th November 1944. Leaving Technical Examination 16th-17th November, 1965 Home Economics. Courtesy Judy Irving, (nee Farquharson). Brighton Technical School. Berwick Street, Brighton, Victoria. Plan of School site. 1933. VPRS 3686/P12. Unit 494. 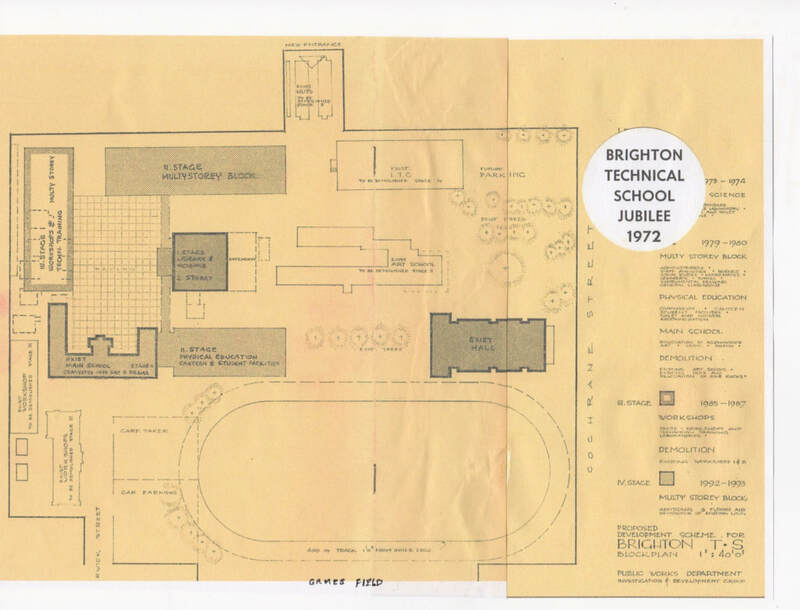 Brighton Technical School land document. Cover of Instrument No. 1257300. Source : Land Victoria. Brighton Technical School land document. Instrument No. 1257300. See Certificate of Title Volume 5145 Folio 904, and Certificate of Title Volume 8171 Folio 986. Source : Land Victoria. Certificate of Title. Volume 5145 Folio 904. Note : Encumbrance referred to : Instrument of Transfer. No. 1257300. Brighton Technical School. Berwick Street, Brighton, Victoria. The School's 50th. Anniversary. 1972 "Sea Spray" Magazine.